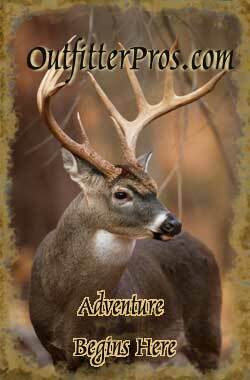 Find and Book a Hunting Trip with Professional, Pre-Screened Texas Hunting Guides / Outfitters. Trophy Whitetail Deer, Eastern and Rio Grande Turkey, Wild Hogs, and Exptics top the list of the most sought after game in Texas. In West Texas, Mule Deer and Antelope are plentiful. We'll help you find a professional Texas Hunting Guide / Outfitter for your next hunt, simply click Find A Hunt or select a gun or bow below after reviewing the Texas Hunting information. Hunting in Texas ranks with the best in the nation. The variety of wild game is great, and is often abundant. The feature Texas game animal is the whitetail deer, found almost statewide, but most densely in the Hill Country of Central Texas and in South Texas where they live in greater numbers than anywhere else in the nation. Hunters from across the country and the world have been coming to Texas for years looking for that Mui Grande trophy whitetail. Mule deer and pronghorns are found in West Texas. Other wild animals include javelinas, coyote, bobcat, mountain lion, and wild boars / feral hogs. Game birds include a great variety of migratory waterfowl that winter in Texas, plus wild turkey, bobwhite and blue quail, mourning, white-tipped and white-winged doves, pheasants, prairie chickens, and sandhill cranes. Of unusual interest are several ranches where exotic game animals are stocked for year-round hunting. Among the popular species are Indian black-buck antelope, wild Corsican rams, African aoudad sheep, axis and sika deer. 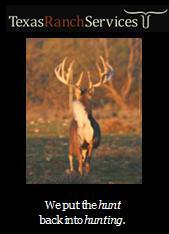 Texas Hunts Select the desired species & weapon below and click "Go"